The ability to bring a subset of your documents from Preservation, Discovery, or Trial, to a new home has long been available on request. Recently we put that power directly into your hands – removing the need to involve your Nextpoint account contact. It’s handy when an evolving case needs to move to the next stage or you just need to shift a subset of documents to an entirely new matter. This new capability is available, to “Advanced”-level users, as a new option in “Export” dropdowns and via Promos (like the one above) which are located around the app. 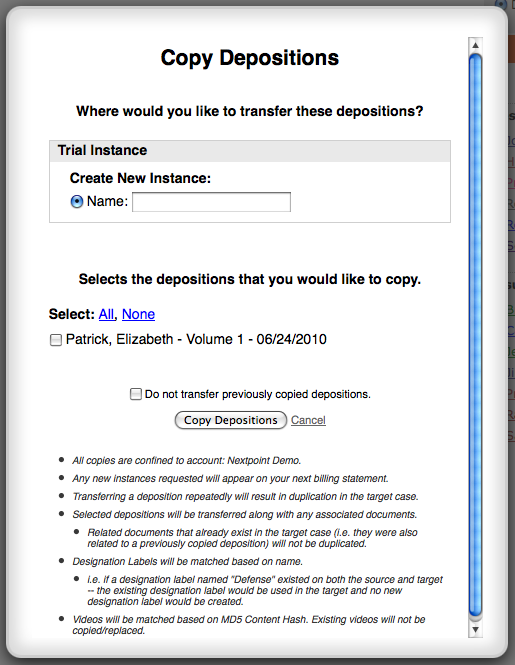 Select the documents (transfer of depositions/transcripts available from Trial instances) — select the destination instance (existing or new) and click ‘go’. That’s it. We’ll bring across associated meta, designations, videos, document relations, etc. It’s a powerful and easy-to-use tool that we hope you really get a lot out of.